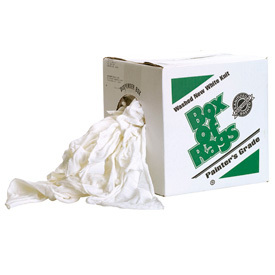 Ideal for use with finishes and other shop use, Box of Rags® T-Shirt Rags are made of all new knit material, are virtually lint free, and have been washed for increased absorbency. Comments On Dec 24, 2013:Exactly what I was looking for, I use these for all kings of finishing. If you use them on your lathe be sure to snip any dangling threads and keep them short or folded so they don't catch. I like having clean rags for finishing that aren't covered in dust or chips to cause scratches or marks when I'm applying my finish. Excellent value, will be buying more when I run out.